In news that won't surprise anyone paying attention to forums, Twitter and rumour sites, Panasonic has confirmed the imminent arrival of the GH5S mirrorless camera. Whereas the GH5 is described as its ultimate hybrid camera and the G9 the ultimate photo camera, the new GH5S is described as the ultimate video camera. 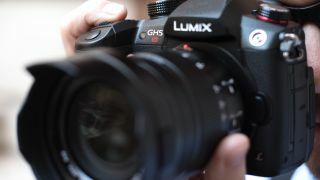 As such, the new model will sit alongside the existing GH5 in the Lumix lineup, rather than serve as a replacement. In contrast with every other current G-series model, which offer either a 16MP or 20MP sensor, the GH5S uses a brand new 10.2MP High Sensitivity chip. 10.2MP might sound a little on the low side, but these pixels are 1.92x larger than those on the GH5’s sensor – and this potentially bodes well for dynamic range and noise. Indeed, Panasonic is claiming the model offers the "highest-ever sensitivity and video image quality in the history of LUMIX cameras," while new Dual Native ISO Technology is said to further allow for low noise when shooting in low-light conditions. The camera's native sensitivity range stretches between ISO 160-51,200, in contrast to the GH5's ISO 200-25,600 range, although expansion settings are available for both models. The company has also re-introduced its Multi Aspect Ratio sensor technology, a feature that it has used in previous models such as the LX100 and GH2. With this, the camera is able to get the same angle of view whether you're shooting in 4:3, 17:9, 16:9 and 3:2 aspect ratios. The GH5S also has the honour of being the first mirrorless model to capture 50/60p footage at the DCI 4K (4096x2160) resolution, and does so without a crop factor. Other video-specific highlights include 4:2:2 10-bit recording, with 400Mbps All-Intra capture for UHD 4K at up to 30p, and the same for DCI 4K at up to 24p, and 200Mbps All-Intra for Full HD recording. Timecode IN/OUT, meanwhile, also means the camera can generate a timecode signal for other devices that are recording at the same time. Further good news for prospective purchasers is that the V-Log feature, which was only available as a paid update on the GH5, is to be installed on the GH5S as standard. There are also two SDHC/SDXC card slots, with support for the UHS-II standard in both and the possibility of using cards up to the V90 rating. Panasonic also claims the camera does not impose time limits on recording, regardless of whether you're shooting in Full HD or 4K resolutions, and support for 4K HDR video with Hybrid Log Gamma (HLG) is also provided – something that may interest those who have recently bought a 4K television. The camera's 4K PHOTO mode allows for stills to be extracted from 4K footage at a resolution close to 8MP, and for 60fps burst shooting at the same resolution, although the sensor's pixel count has meant that the G9 and GH5's 6K PHOTO mode has not been included here. Elsewhere, the camera offers 14bit Raw capture with burst speeds of up to 11fps as standard and 7fps when continuous autofocus is enabled. When shooting Raw files in the 12bit mode, this is marginally increased to 12fps and 8fps respectively. The model also inherits Panasonic's Depth from Defocus autofocus technology, which is said to bring subjects to focus in as little as 0.07sec. Panasonic also claims the camera's autofocus system is capable of focusing down to an impressive -5EV. The camera's design closely follows that of the GH5, with a magnesium-alloy construction that has been sealed against dust and splashes, and the promise of continued operation in conditions as low as -10ºC, while the internal shutter is rated to 200k actuations. One feature the camera does not carry from some other Lumix models is body-based image stabilisation, although it will benefit from the equivalent optical image stabilsation (OIS) technology found in many Lumix lenses. Other features include a 3.68million-dot electronic viewfinder that provides a 0.76x magnification (in 35mm terms) and a 120fps feed for smooth display. This is joined by an LCD screen that flips away from the camera's body and can be controlled by touch, such as for setting the focus point and for menu operation. Battery life is rated to 440 shots per charge when using the LCD screen, although this will change when using the viewfinder or (more significantly) after adjusting power settings. This is a marginal improvement on the 410 frames-per-charge offered by the GH5. The Night Mode feature that we've seen before has made the cut, and the user now has the option to alternate the shooting GUI between three different screens to better suit whatever their shooting, namely Photo Creator, Filmmaker and Video Creator (above). The Panasonic GH5S goes on sale on at the end of January with a body-only RRP of £2199.99 in the UK and €2549.99 in other European territories. We'll update this with pricing for the US and Australia once we have it.